A Simple and easy preparation For bachelor's and hostelers especially. 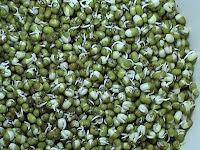 With raw sprouted green gram we could prepare lot of healthy snacks for our supper. Now Sweet dish is ready. 2. 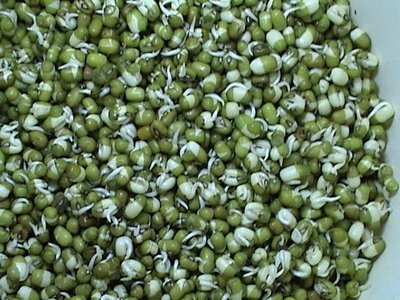 Take bowl full of raw sprouted green grams, add little pepper powder, pinch of salt and little lemon essence. Now another dish is ready. 3. Take bowl full of raw sprouted green grams, add raw tomato,little coriander leaves, onion pieces,salt, pepper. One more new taste of food. 4. Take bowl full of raw sprouted green grams, add coconut, pepper, salt and lemon essence.
" You can add vegetable pieces like carrot, cabbage and beet root into the above said any one item"